Peanut butter and celery. A match made in heaven! Nothing like a nice day in Seattle to encourage a stroll in the neighborhood. 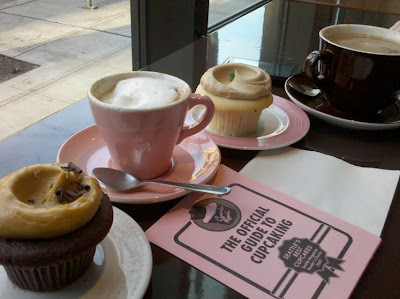 This time, the BF and I strolled into Cupcake Royale. Not only do they bake up the best cupcakes in the neighborhood (using only local ingredients without any preservatives), they also brew up a great cup of coffee to go with it. Pictured below on the left is my all-time favorite, the Salted Caramel. It's a simple chocolate cupcake base with the most deliciously decadent salted caramel frosting. 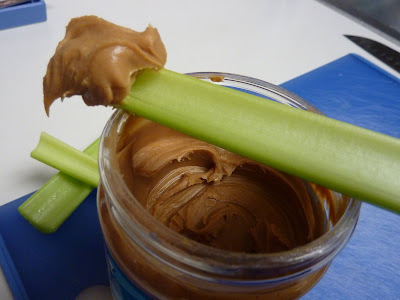 It has just enough sweetness and caramelly richness, and just enough salt to contrast. 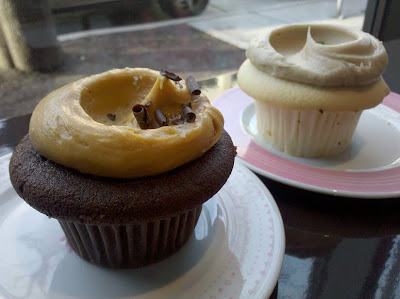 The cupcake on the right is the Irish Whiskey Maple cupcake. It was their special monthly flavor for March, which was when this photo was taken. It too was delicious -- maplely sweet frosting with a kick of actual whiskey on top of an anything-but-ordinary vanilla cupcake. Cupcake Royale's cupcake-of-the-month is a real treat, and its unveiling on the first of every month never fails to surprise me. June is upon now, which means warm days ahead (though that still might be a ways for those of us in Seattle). So this month, something summery and a bit tropical is appropriate. So what's the cupcake of this month? It's Toasted Coconut Lime! I haven't tried it yet. But I absolutely can't wait. Coconut cake and lime buttercream...my mouth is watering.